Invest in a quality distribution box if you're working away from a set or studio, or in any environment where you need temporary, portable power. Distro boxes are recommended for film, stage, theater and event productions and provide compact, lightweight on-the-go power. Top manufactures like Motion Lab, Lex and Mole-Richardson make distro boxes designed to withstand the rigors of the professional film industry. Find the right electrical distribution box in our selection. Motion Labs Non-Breaker Stringer Box, L21-20 I/O X 6 Duplx Edison. 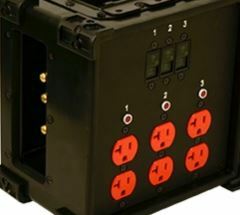 From the power-packed Lex 200-Amp Three-Phase Power Stations Jr. that offers five cam-type color coded inlets and 24 duplex receptacles housed within a weather-resistant, stock-resistant body to the affordable Motion Labs Non-Breaker Stringer Box that weighs just 5 pounds, BarnDoor Lighting surely has the ideal distro box for your budget and needs. Choose from Cam-Lok, bates, stage pin and 19-pin. Have questions? Reach out to us via phone at: 1-888-276-3667, or e-mail, if you aren�t sure which type to buy.